Musically, Jack Tempchin has provided the soundtrack to many lives. 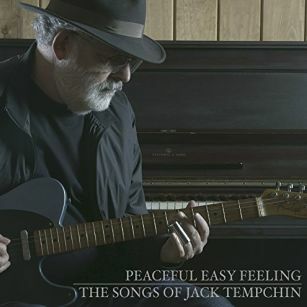 Jack gathers songs he has written for, and with, the Eagles, Glenn Frey, and Johnny Rivers on his recent release, Peaceful Easy Feeling: The Songs of Jack Tempchin. As the title suggests, Jack Tempchin was the man behind the song release that jettisoned the Eagles into a worldwide marketplace. “Peaceful Easy Feeling” was a co-write between Jack Tempchin and his roommate at the time, Glenn Frey. Jack tributes the release to his long-time friend, stating that ‘this album is dedicated to my great friend of 46 years, Glenn Frey. Glenn and I always had a fabulous time writing songs together. We would talk about our lives and laugh. He was the funniest person I’ve ever had the pleasure to know. It was my great good fortune that my buddy happened to be one of the best songwriters of all time. Goodbye my friend and musical brother. Thanks for all the wonderful times’. While Glenn Frey was on hiatus from the Eagles, he wrote two tracks with Jack Tempchin that became closely associated with television and movie soundtracks. Peaceful Easy Feeling features Jack’s take on the songs as he tenderly offers “Part of Me, Part of You” from the film Thelma and Louise as well as his version of “You Belong to the City” from Glenn’s solo career, a key musical moment on the series Miami Vice. Guests stop in on the recording, Peaceful Easy Feeling playing host to Janiva Magness as she duets on another Glenn Frey solo track “Soul Searchin’” and welcomes Rita Collidge in for the Johnny Rivers’ hit “Slow Dancing”. Former Byrds/Flying Burrito Brothers member, Chris Hillman, and his Desert Rose Band bandmate, Herb Pedersen, join Jack Temphin on the Eagles track “Already Gone” and on “It’s Your World Now”. Peaceful Easy Feeling: The Songs of Jack Tempchin brings the work of past decades back, revisited by the man who first gave them life as Jack Tempchin glides over the fat saxophone notes coursing through “The One You Love” and shakes up the rhythm to advise “Everybody’s Gonna Love Somebody Tonight” as he offers an unreleased cut that he penned with buddy Glenn Frey in “Privacy”.